With the upcoming publication of Oppenheim’s International Law: United Nations and the highly anticipated launch of Oxford International Organizations (OXIO), international law has never been more relevant. Oppenheim’s International Law: United Nations is an authoritative and comprehensive study of the United Nations’ legal practice. The United Nations, whose specialized agencies were the subject of an Appendix to the 1958 edition of Oppenheim’s International Law: Peace, has expanded beyond all recognition since its founding in 1945. This volume represents a study that is entirely new, but prepared in the way that has become so familiar over succeeding editions of Oppenheim. Oxford University Press and the Manchester International Law Centre (MILC) are developing a database of annotated documents pertaining to the law of international organizations (OXIO). This will include documents such as resolutions of international organizations, reports of legal advisers, judicial decisions, international agreements, or any act of legal relevance. 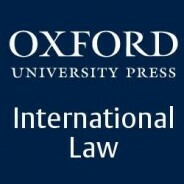 Along with Oppenheim and OXIO, Judicial Decisions on the Law of International Organizations and The Oxford Handbook of International Organizations offer a comprehensive analysis and commentary on the role of international organizations today and provides commentaries from leading experts in the field of international institutional law organised by legal category. From the United Nations to UNICEF, this quiz will put your international law knowledge to the test. Featured image credit: “Flag of United Nations”, public domain via Wikimedia Commons. Ina Christova and Gabby Vicedomini are part of the Law Marketing Team at Oxford University Press.